We had some lovely days at River Dunes which is a real hurricane hole. We ate at the restaurant, biked, toured the new homes, took the spa showers and enjoyed the resort/Marina. Also accomplished laundry and grocery shopping. The only downside was the really poor cell phone coverage so we felt very out of touch. We left early this morning and drove right past Beaufort, North Carolina to tackle shoal ridden Bogue Sound. The sands have shifted in the ICW, especially in the inlets. We passed two sailboats grounded and heard more calls on the VHF. The high point of the day was the dolphins. 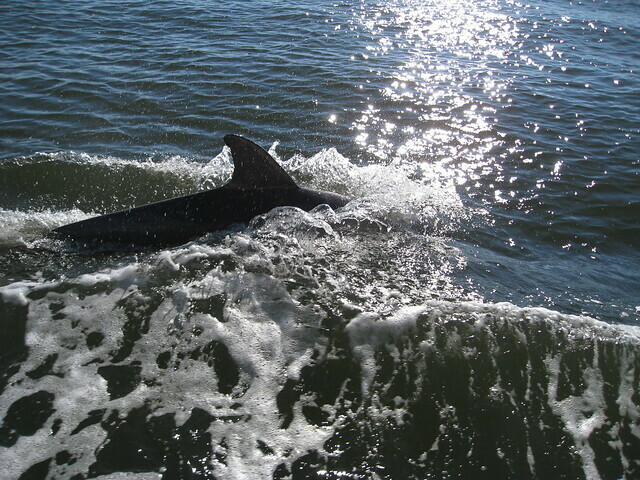 We were the lead boat and had dolphins right beside us for almost 15 minutes. Almost close enough to touch. We ended anchoring at Mile Hammock, a part of Camp Lejeune. Luckily there are no live firing exercises this Sunday. 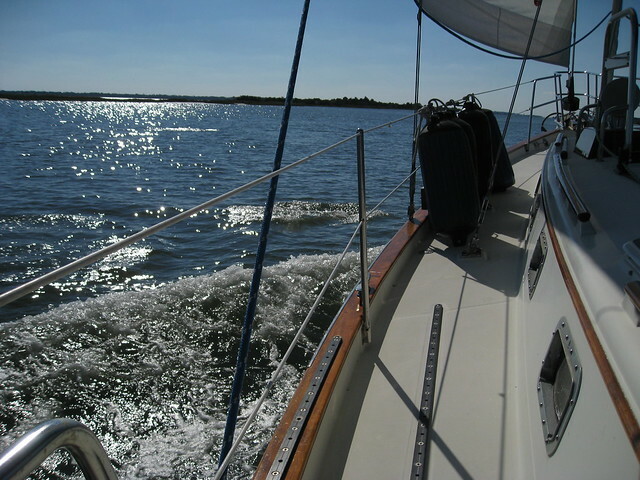 Last chance for sailing before entering the “ditch” (ICW) A pack of 6 dolphins swam right beside the boat. Close enough to almost touch. Ed, we’re on the Waccamaw, Charleston tomorrow. Don’t do the southern route at low tide. We went through Lockwoods at high tide and saw 10′ the whole way – but that’s a 5′ tidal swing. Bad part about high tide, bridges. 64′ is not 64′ at Holden Beach bridge! A new wind instrument, windex and lightning arrester are in our future. Be safe.